Hey there! 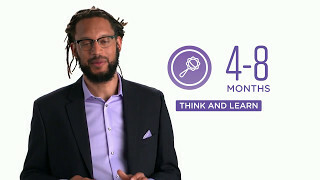 I’m Stephen Brackett, bringing you the Colorado Early Learning and Development Guidelines’ video for 4-8 months… How they think and learn! Some of the milestones you may be seeing at this age center around memory and learning! Set up daily routines, so he knows what to expect. Knowing what comes next will help him face his day with confidence. And finally, lead by example! Play with familiar toys and allow him to imitate your actions. And remember… all children learn, grow and develop differently. What works for one child, may not work for another. But, that’s okay! Just follow his lead and you guys will be fine. To learn more about what most kids are doing from 4-8 months old, check out the Colorado Early Learning and Development Guidelines at: www.earlylearningco.org. Hey there! I’m Stephen Brackett, bringing you the Colorado Early Learning and Development Guidelines’ video for 4-8 months… Learning and Interaction! Some of the milestones you may be seeing at this age center around exploring! Playing with his hands, fingers and toes, and, touching and reaching for things he wants. He’s also beginning to realize that he has the power to make things happen! Give him toys that make sounds or do something unexpected when he plays with them. Sit on the floor with him and respond to his noises and facial expressions. Let him take the lead and follow his actions… and remember to make eye contact! Talk about what you’re seeing and doing. Remember, he’s learning to communicate, so lead by example! And, don’t forget to play with him! You are his favorite toy right now. Learning Development Guidelines at: www.earlylearningco.org. Most importantly, if you feel you child isn’t hitting some of these goals then please… call your pediatrician. By working as a team, you can help your child can get all the support he or she needs. Hey there! 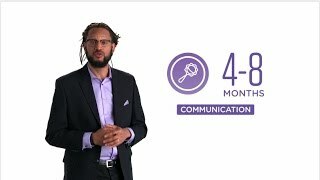 I’m Stephen Brackett, bringing you the Colorado Early Learning and Development Guidelines’ video for 4-8 months… Communication! Some of the milestones you may be seeing at this age center around communicating with his caregivers! Repeating familiar sounds over and over… and over! And maybe even waving hello and goodbye! Now, believe it or not, crying is one of his most important skills. To avoid becoming overwhelmed, think of this as one of his ways of communicating with you… and a demonstration of the bond you share. He’s telling you something. Support him in a calming and comforting way as you figure out what it is. And set up daily routines, so he knows what to expect. Knowing what comes next will allow him to face his day with confidence. And remember… all children learn, grow and develop differently. What works for one child, may not work for another. But, that’s okay! Just follow his lead and you will both be fine. development guidelines, check out our website at www.earlylearningco.org. Hey there! 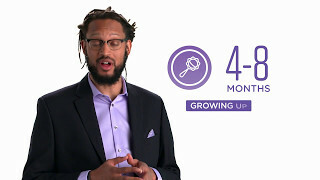 I’m Stephen Brackett, bringing you the Colorado Early Learning and Development Guidelines’ video for 4-8 months… Growing up! Babies at this age are fascinated with what’s going on with their body and trying to gain a little control over it. Some of the milestones you may be seeing at this age are all about movement! And using specific sounds to let you know how he’s feeling! Speaking of getting around… even though your child is still just a few months old, you never know what he’ll do next! This would be a great time to make sure that the places he spends most of his time are child-proof! your child, talk to your pediatrician. Babies from 4-8 months may explore objects with their mouth and by kicking, reaching, grasping, pulling, and letting go. They delight in discovering new skills. Babies at this age can smile, laugh, coo, and reach out to engage their parents and other caregivers. They love to listen and respond to language by imitating the sounds and rhythms of what they hear. Look at an object in their hand, mouth it, and then take it out to look at it again. Expose them to a variety of sensory experiences — like sights, sounds, tastes, textures, movements, smells — both indoors and outdoors. Listen to the sounds that people use while talking in the language they use at home, and use these same sounds while babbling. Provide infants with both calming and exciting experiences depending on their signals. Kick feet while lying in the crib, feel the crib shake, and then kick feet again. Show they enjoy physically active play by repeating actions (e.g., kick, wave arms, roll over). Gently turn, roll, bounce, and sway them to increase their muscle strength and help develop important connections between the brain and muscles. Provide periods of unstructured movement every day, allowing the infants to move freely on the floor. Hold head, roll from back to stomach and from stomach to back. Move from a sitting position onto hands and knees. Provide opportunities for them to move and engage in a variety of physical activities, such as lying on a blanket on the floor in a safe area. Reach for and grasp an object, using one hand. Provide safe (i.e., no small parts or pieces) objects and toys and play games to encourage the infants to move and do things for themselves. Give infants appropriate finger foods to eat when they are ready (e.g., dry cereal, cooked vegetables). Place objects of interest just beyond their reach to encourage stretching and coordination. Engage in playful, face-to-face interactions with an adult, such as taking turns vocalizing and then smiling or laughing. Provide regular interactions with them. Make eye contact with them during routine activities such as feeding, diaper changing. Talk and coo during interactions with them; imitate their sounds. Provide them with opportunities to be around and observe other children, including those slightly older. Allow older children to talk, smile and laugh with the babies. Cry when hearing another baby cry. Stop playing and look at a child who is crying. Talk to them about what other children are feeling or expressing with their sounds, gestures, or facial expressions. Turn excitedly and raise his arms to greet a family member at pick-up time. Respond consistently to them, using warm facial expressions and words. Respond to their cooing and babbling as if they understand everything you are saying. Imitate sounds or gestures that babies make and allow time for them to imitate you. Use every day routines to play games, like waving goodbye or blowing kisses. Look at pictures that a parent or caregiver points to while reading a storybook or hold a book and try to turn the pages. Read to babies and provide cloth or cardboard picture books for them to hold. Shake a toy, hear the sound it makes, and then shake it again. Loudly bang a spoon on the table, notice the loud sound, and do it again. Allow babies time to explore and examine objects and new things. Offer toys that they can grasp and explore. Shake sound toys so babies can hear and respond. Imitate a familiar gesture, such as clapping hands together or patting a doll’s back, after seeing someone else do it. Play with familiar toys, such as shaking a rattle or patting a soft toy, and allow time for babies to imitate your actions. Start to remember things. For example, they may turn toward the front door when hearing the doorbell ring or toward the phone when hearing the phone ring or they may look for their parents after they briefly step out of the room. Play games that involve repetition (e.g., peek-a-boo, pat-a-cake, finger rhymes).